So the other day, I was watching Nathan toddle around when I noticed he was chewing on something (You know he likes to chew on anything weird, and he chews on it slowly and subtly so that I won’t notice). Well, I opened his mouth, but he had tucked it in between the side of his cheek and his gum. After some searching, I finally pulled out his bounty… A PIECE OF WOOD. It was a thin sliver that was probably about an inch long, but he had been chewing on it for so long that it was actually soggy and pliable. Of course, the first thing I thought about was what if he had swallowed it before chewing on it long enough to make it soft? The second thing? Where did he find it? Sometimes I catch myself wishing I could put him in a bubble to keep him safe. And then I realize that he would just CHEW HIS WAY OUT. 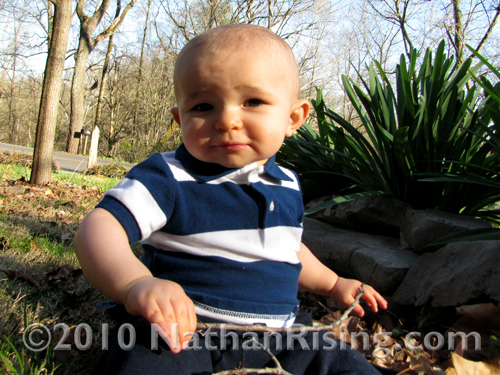 A couple of days ago, Paul, Nathan, and I went out to eat and Nathan started to get a little fussy. 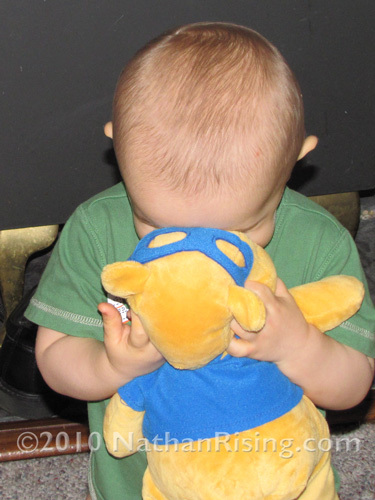 Paul reached into the diaper bag to bring out Nathan’s trusty Pooh Bear that Nathanloves to play with and chew on. 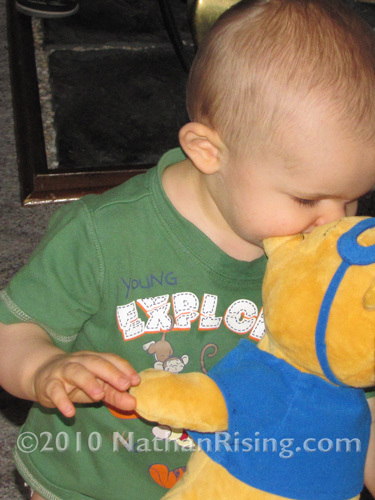 Besides his fingers and the crib rails (and occasionally, my chin), the only other things Nathan will chew on when he’s teething are his stuffed animals, namely Pooh Bear. 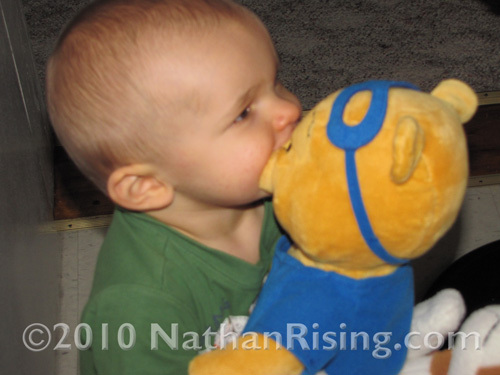 “You know, we need to find some teethers that Nathan actually likes so he’ll use them,” Paul said as he handed Nathan the Pooh Bear. 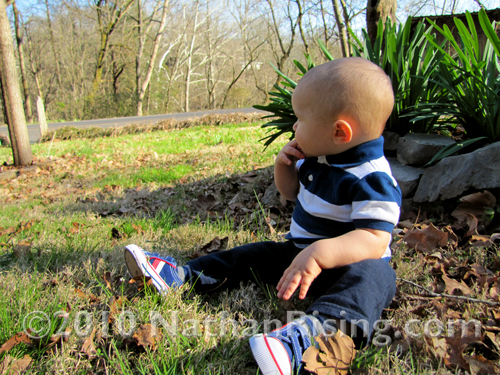 I’ve really been taking advantage of the lovely weather we’ve been having recently by taking Nathan outside and letting him explore. 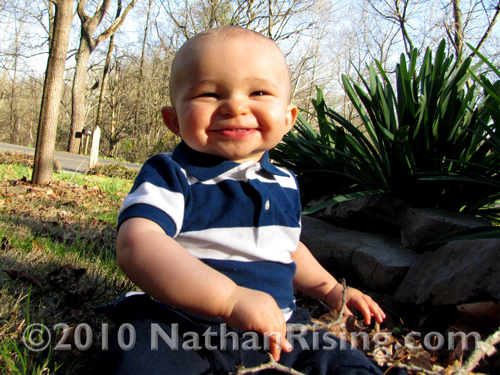 And, as you all know, he absolutely loves being outside. 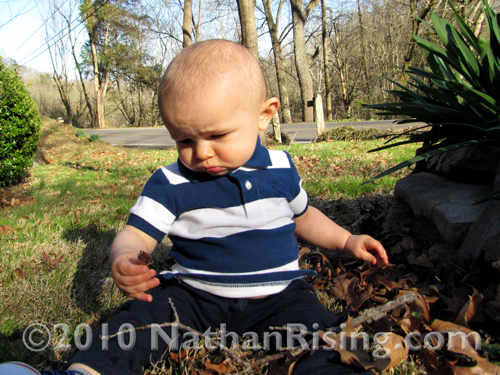 And he really loves playing with twigs, leaves, and pretty much whatever he can get his little hands on. He wants to examine everything. And when he picks up something he hasn’t picked up yet, he’ll often look at me inquisitively, as if to ask Is this edible, Mom? because I know he’s just dying to drool and chomp all over it. It seems like his poor gums are constantly hurting. He drools so much that he and I both are swimming in it by the day’s end. I wish I could get him to take a teether, but he’s just not interested in any of them. Poor little guy. When will all his baby teeth come in?